We just recently returned from a week’s stay in Puglia and I now have a number of new Pugliese recipes I want to recreate at home. This is one dish, simply called Fave e Cicoria, that I found quite unique and we saw it listed on a number of restaurant menus while we were traveling around Puglia. Consisting of a simple fava bean puree made with dried fava beans, this dish was often served as a first course topped with sautéed cicoria as I show in my photo. To turn this dish into a complete meal, I added a spoonful of oven roasted tomatoes, some roasted sweet peppers, and a couple of roasted spicy sausages although it would make a delicious vegetarian entree if served on it’s own. It is best to soak the dried fava beans in water for at least a couple of hours before you cook them which cuts down the cooking time significantly. The potatoes are not completely necessary, but they do help create a nice texture to the puree. 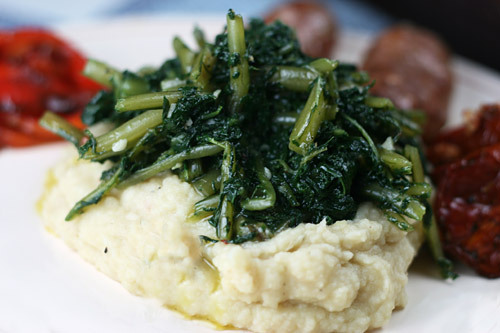 A traditional vegetable dish from Puglia. Soak the fava beans for at least two hours, then drain, then place the beans in a pot and top with the potatoes. Add enough water to cover the beans and potatoes by at least an inch. Bring to a boil, then reduce the heat to a simmer and cook for an hour, adding more water as needed. Taste the beans and continue to cook until very soft, another 30 minutes or so. Drain out any water left and add 1 teaspoon of salt and 1/3 cup olive oil. Beat the mixture with a wooden spoon until smooth, then set aside. Trim the cicoria and cut into 2 to three in ch pieces. Bring a large pot of salted water to a boil, and then add the trimmed greens. Cook, stirring every so often until the greens are soft, about 10 minutes. Drain well, squeezing out as much liquid from the greens as possible. Add 3 to 4 tablespoon of the oil to the pot with the garlic, some black pepper, pinch of salt and red pepper flakes. Cook until the garlic begins to sizzle and then return the chicory to the pot. Toss with two spoons to coat the greens with the olive oil garlic mixture and cook just for a minute or two. 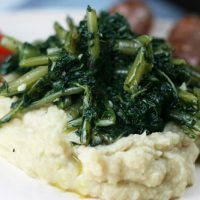 Serve a scoop of fava puree on each plate topped with a spoonful of the sautéed chicory. Drizzle with a little extra olive oil, and sprinkle with cracked black pepper.